This crochet pattern was made upon request. The dress is crocheted from top down, starting at neck and working in the round to form neck opening and the beautiful leaf yoke. The top-down construction makes it possible to try it on as you go for the perfect fit. Length can be also regulated, so you can crochet a stunning gown for your wedding. Intricately decorated with crochet leaves this sleeveless dress will define your bust, while flattering curved lines draw attention to hourglass shape. 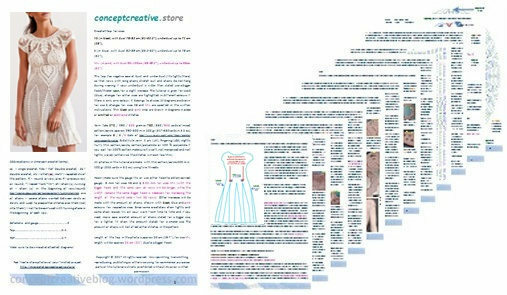 ► written explanation of all rows of the diagrams (in case you are not used to work with the crochet charts); keep the original margins of the file. This dress crochet pattern is provided for sizes: XS-S-M-L.